Joop Mulder, founder of the Oerol Festival on the island Terschelling was born in 1953 in Bolsward, a little town in Friesland, in the north of The Netherlands. 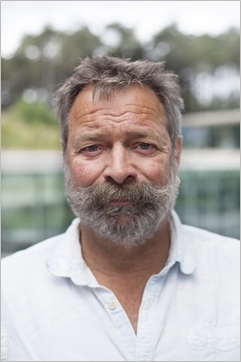 Over the past 35 years he built up the site specific festival Oerol using the island as a stage; nature and culture, mapping the landscape, always looking for new ways to present outdoor arts in nature. The island is a laboratory of location theatre and landscape development, and many young artists have discovered their own way of working outdoors, with a natural stage and with the environment as inspiration for the arts. Joop has brought his philosophy to China, South Afrika and Chile. He spread the term ‘site specific’ all over Europe and created an island festival on Governors Island in New York. These days he is busy creating his ‘Sense of Place’ project along the coast of the UNESCO World Heritage site, the Wadden Sea. Imagine living at the bottom of the sea? What do we do if the sea level rises? How did Holland become The Netherlands? Mapping the Landscape of the beautiful Wadden area, with mounds, dikes, mudflats and polders. Man created this landscape below sea level. Joop never stops dreaming about landscapes and their history. With land art, architecture and site specific theatre he gives a gift to his audiences – a pair of glasses to discover the beauty of the landscape and its stories. As Shakespeare wrote in King Lear : "Thou nature art my Goddess. To thy law, my services are bound”.